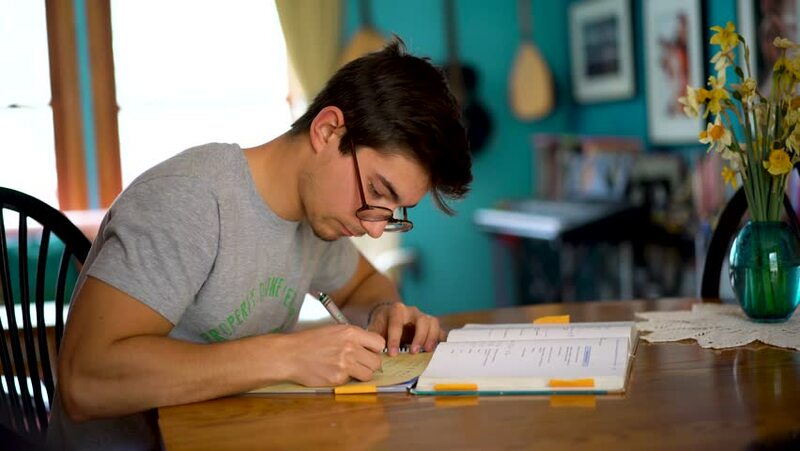 High side shot of teenage boy doing math homework at dining room table. hd00:25Teen boy working on laptop computer in living room. Young programmer at his desk. hd00:15Happy elementary school children drawing at communal tables in classroom. 4k00:08Portrait of busy young business man sitting with glass of drink and hamburger in fast food restaurant interior. Attractive caucasian eating and using notebook computer in cafe. 4k00:17Low angle side shot of teenage boy doing math homework at dining room table. 4k00:10Side shot of teenage boy doing math homework at dining room table. 4k00:09Closeup of teenage boy doing math homework at dining room table. 4k00:14Teenage boy doing math homework at dining room table. 4k00:16Front shot of teenage boy concentrating and looking at math book.